In all the legends and myths of the ancient world, Cetus is associated with the idea of wickedness, or of ferociousness. 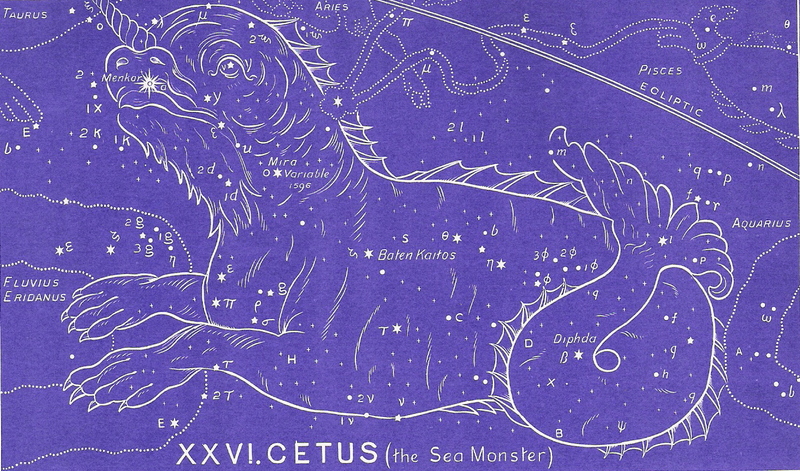 He is portrayed as the “Dusky Monster”, Jonah’s whale, or Job’s leviathan. The Chaledeans regarded Cetus as the ferocious Tiamat. The Greeks said that he is the sea monster sent to devour Andromeda, and hence, he was destroyed by Perseus who caused the monster to be turned to stone by holding the head of the Medusa before it. The truth is that this sign DOES represent evil in its entirety. He is the enemy of our souls, Satan and all the influences Satan evokes in the world. Cetus is the biggest constellation (exception Argo, which is actually a composite of three constellations), and it’s true that this enemy can seem like the biggest obstacle to overcome. But we must remember the whole picture. Here is the huge, ferocious beast — and yet he is being trampled on, his bands are being cut, and a river of fire is scorching his forepaws. We must go back to the original Seed-prophecy we discussed in Scorpio. Remember in Genesis 3:15, God gives a prophetic message to Eve. He tells her that her Seed (Jesus Christ) will crush the head of the seed of the snake (Satan), while the seed of the snake will bruise the heel of the Seed of the woman. We finally see this prophecy fulfilled in Cetus. This star sign represents the time (soon?) when Jesus Christ will return to take His place as ruler of this world. Evil will ultimately be defeated. Cetus is a three-natured beast. He is part fish (tail), part reptile (head), and part mammal (paws). These three natures represent the three sources of our imprisonment of sin. The fish represents the world. The mammal represents the flesh. And the reptile represents the Devil. These are the three areas in which the Church will struggle as long as we are connected to this world (and this monster!) by The Band. But don’t forget!! Aries has broken that band now. The Church is the beautiful Cassiopeia enthroned in Heaven and partaking of the Marriage Feast. The three areas of our enslavement are being defeated in this sign. Look closesly. First, a river of God’s wrath is scorching the paws (the flesh); next Aries is pressing down on top of the head and neck (the Devil and the world), and finally Taurus the Bull is trampling down on its head (the Devil). This is a picture of complete defeat. Remember that Aries and all his decans (associated constellations) represent the fulfillment of all God’s promises to the believers. And Cetus represents the completion of that original Seed-Prophecy. Here is the seed of Satan receiving the crushing bruise to the head from Aries (the triumphant Lamb that was slain) who is trampling this sea monster under its feet with the same forepaws that are severing the band (The Band) that binds the fish (Pisces). The River of Light that issues from Orion’s foot is flowing directly into the monster who is desperately trying to stop it with its forepaws. And finally, the bands that had been his only source of power and influence in the believer’s life are being cut! This is a vivid picture of the Rapture and its double-edged effect –the escape of the Church and the judgment of the enemy. Pay careful attention to the meaning of the names of the stars. They will always back up the message in The Gospel Truth above. To continue in the correct order of the ancient star chart, please select Perseus next. Or click on The Big Picture to learn more about the Gospel in the stars.